Artist and color consultant Barbara Mayfield on making one's world sing with color. Dignified Exterior Colors, with a Twist. A White, a Light, and a Dark and Deep. An exterior color scheme. There’s a large, beautiful house about 15 minutes away, and the owner guy “R”, called me in to work with him on choosing colors for the exterior. Right now he has bright white stucco with Wedgewood Blue trim and shutters. Wedgewood Blue is the color his ex-wife had chosen and although it is a good color, R is ready for a change, and I agreed with him. Enough already with the colors of the past. New chapters of life almost always demand a new freakin’ color scheme. In my work as color consultant, I’m witness and midwife to all kinds of life transitions my clients are experiencing. It’s an honor and a privilege. Thank you, Wonderful Clients! …..but so much for my take on the place. R’s vision: remove the shutters because they were not part of the architect’s original design. Add the flower box on an upper window that was part of the architect’s vision. 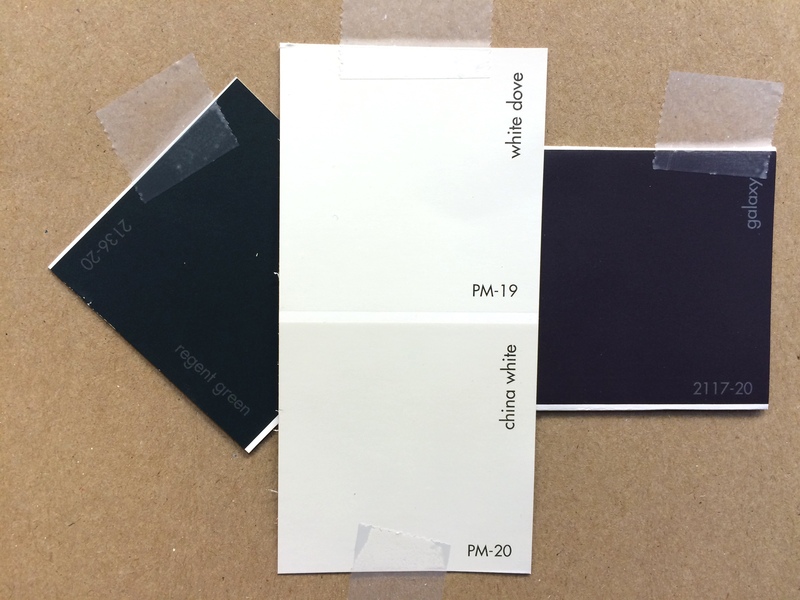 Do a white-on-white stucco and trim thing. And a punch of color on the doors and maybe the gate. SO: He has chosen China White for the stucco. White Dove around the windows and trim, the garage doors and the garden gate. A major statement in off-white! What about the “pop” colors? Black? Deep green? Carriage Red? Well, it is amazing what happens during a color consult, because color is such a powerful force in our lives and everyone is passionate about color even if, at first, they are only passionate about what they don’t like. During our session it was revealed that R secretly and passionately LOVED the color purple. I almost fell on the floor. He has purple shirts and ties, he says, and purple socks, which are not easy to find. We are talking about a conservative business person here, who, apparently, buys high quality purple socks online. AND it turns out, that although he loves it when other people paint their front doors purple, he could not imagine a purple door on his dignified home. It didn’t take me long — maybe 8 seconds — to whip out the glory of Galaxy 2117-20, a dignified deep deep purple on its way to black. It’s the color of the universe, I said. How great is that? R is seriously tempted and is still considering. This would a big step. It would look great. He may go with Regent or Essex Green, but I am encouraging him to let himself have a galactic front door for his new chapter of life. Feast your eyes on these purple doorways. Purple can express whimsy, enchantment, and playfulness, as well as creativity, epic dignity and class. If a full-on purple is over the top for your dwelling, but you’d like to let a bit of this kind of color magic in, consider a periwinkle like Brazilian Blue 817, or a light grey-violet like North Cascades 1411 or pale grey-lavender like Whispering Wind 1416. A dignified purple door entryway. Vacation Homes Need Color, too. Paintings by Barbara Mayfield. Arrange a studio visit. The “Garden” paintings on display for an open studio day. The first Land of Enchantment paintings on display for an open studio day. Land of Enchantment paintings on display for an open studio day. Casita. 5″x5″ mm on paper. From the Land of Enchantment series ©2018 Barbara Mayfield. Spent a week painting in the Sugar House studio at Spring Hills Farm, near Scranton.